RICHMOND, British Columbia (PGA of BC) — Just because temperatures are dropping and the winter months are approaching doesn’t mean it’s time for golfers in British Columbia to pack away their clubs until next season. In fact, many of the PGA of BC’s top teachers will tell you that there’s no better time than now to make improvements to your game. With plenty of golf facilities across the province offering space to practice and top-notch instruction 12 months of the year, it’s possible to make big strides before the season starts anew in 2018. “People who put in the work in the winter are always rewarded,” said Northview Golf Academy Head Teaching Professional Matt Palsenbarg, who was named the PGA of BC's Coach of the Year in 2016. “I think it’s important to realize that the offseason is the key to being a good golfer. Royal Colwood Golf Club’s Mac McLeod, the 2017 recipient of the PGA of BC’s Alvie Thompson Teacher of the Year Award, said the winter season is the ideal time to make changes to his students’ fundamentals – alignment, grip and posture among them – so they can be engrained by the time courses have re-opened across the province. Some golfers may find it frustrating to implement changes to their setup or swing the middle of summer, particularly if they don’t lead to instant improvement in their scores. But with limited opportunity to play through the winter, golfers who take offseason lessons from PGA of BC Professionals can focus on learning and practicing, and avoid the temptation of reverting to bad habits when there’s no score to worry about. “It’s harder to make changes to your swing when you’re also trying to play good golf,” said Palsenbarg. Nicklaus North Golf Course has been closed since Thanksgiving weekend, but there’s still plenty of activity at the Whistler club. Each winter, Nicklaus North’s pro shop is transformed into a practice facility – complete with a hitting bay and launch-monitor technology -- where local players work hard at their technique as snow blankets the course, and enjoy the results later on. Nicklaus North is one of many BC facilities where the course may be closed but the Professional staff will spend the winter making their students’ games better. 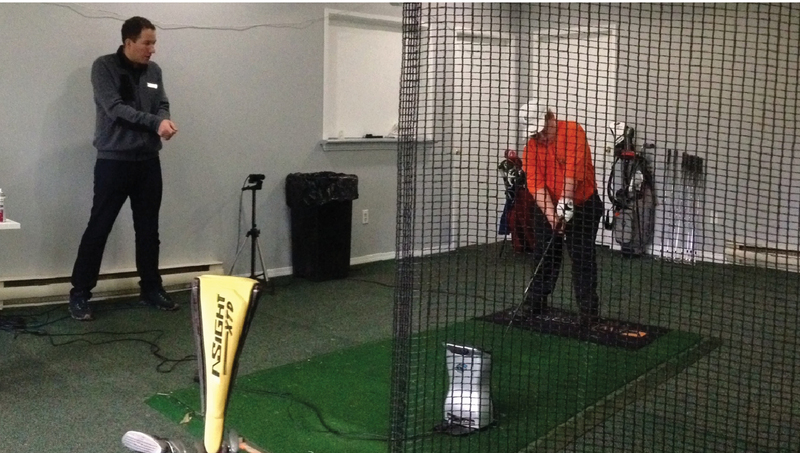 Advancements in teaching technology have allowed instructors to work with their students in an indoor setting while still receiving the ball-flight feedback they need to monitor progress. Now widely used across the industry, radar- or camera-based launch monitors make it possible to project the path and distance a ball will travel and offer a wealth of other information that hitting into a net alone could never reveal. McLeod sees the technology as a valuable tool in allowing the golfers he works with to visualize the improvements they’re making. “The machine backs up what I’m trying to portray, and sometimes the student needs to see it to fully understand or believe what they’re doing is the right thing,” said McLeod, adding that there’s a cool factor for students that comes with seeing their ball flight simulated as well. Kehoe said he also notices big advantages in working with students in a more controlled setting during the offseason compared to sessions on the grass range during the summer. Although some golfers choose to consult their local Professional for a quick tune-up before their winter golf getaway, taking lessons regularly in the months ahead can help set up players for their most successful summer of golf yet. Looking for a PGA of BC Professional to help improve your swing this winter? Check out our website’s Find a Facility function to see where you can connect with a Professional working in your community.